Not to be confused with Kaymakchal. Kajmakčalan (Kaimakchalan), or Kaimaki or Kaimaktsalan or Voras (Greek: Καϊμακτσαλάν or Καϊμάκι or Βόρας, Macedonian: Каjмакчалан, translit. Kajmakčalan), is a mountain on the border between Greece and the Republic of North Macedonia. It is the southernmost and highest peak, 2,521 metres (8,271 ft), of a range known in Greek as the Voras Mountains and in Macedonian as Nidže. The frontier between the two countries runs across the summit. 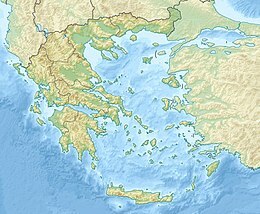 It is the third-highest peak in Greece after Mytikas and Smolikas and the fifth-highest in the Republic of Macedonia. The word "Kaimaktsalan" is of Ottoman Turkish origin inspired by its white, snowy peak: kaymakçalan means 'kaimak beater'. 'Kaimak" in Turkish means "Cream." The peak consists of granite, gneiss and mica. During World War I, in September 1916, the Battle of Kajmakčalan between Serbian and Bulgarian troops took place at Kajmakčalan and around the adjacent peaks, resulting in a Serbian victory. There is a small church and crypt for the Serbian soldiers who died in the battle. Near the top of the mountain, on the Greek side, there is a small church named Saint Peters (Sveti Petar in Serbian), the peak itself is called, besides Kajmakčalan, Profitis Ilias (Greek: Εκκλησία Προφήτης Ηλίας). ^ a b c d "Europe Ultra-Prominences" The summit of Kaimaktsalan is in the Mount Voras ski area and may lie wholly within Greece. Topographic maps give the elevation as 2521m, while the ski resort literature gives the elevation as 2521m. Peaklist.org. Retrieved 2012-02-19. ^ "Óros Voras, Greece/Macedonia" Peakbagger.com. Retrieved 2012-02-19.